Elvis always acknowledged that the most important woman in his life was his beloved mother, Gladys Love Presley. As much as she was important she was certainly was the most influential, encouraging his talent from a very young age. 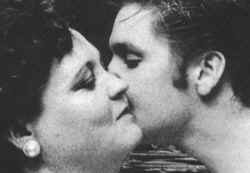 Elvis cherished his mother beyond all ordinary limits, and she in turn spoiled him beyond all limits. When Vernon Elvis Presley was sentenced to three years in Parchman, Mississippi State penitentiary for forging a check, a strange reversal of roles between mother and son took place. Elvis became the man of the family at the tender age of three. Out of this engendered came a quality of caring that was to serve him for the rest of his life. The confusion of Elvis being both father and son was to exist all his life. From that moment on Vernon and Gladys were always ‘his babies’ which was how the adult Elvis referred to them from the age of nineteen when he became the sole breadwinner and support, not only to his immediate family but also to many of his kin. With his first royalty check, Elvis bought his mother a pink Cadillac. But, Gladys always worried that fame would distance her from her beloved son. If Gladys could barely tolerate her son’s famed it was because when away Elvis would call home every night, and talk baby talk for hours to ease her anxiety and pain. By now diet pills and alcohol had led to liver damage and the onset of hepatitis. In Gladys’ case depression was exacerbating her medical condition. And her increasing anxiety about Elvis being enlisted into the army. It was the army, not fame that finally separated mother and son. When the army torn Elvis away from her protective arms it broke her heart. Only 6 months after Elvis enlistment on August 14, 1958, Gladys Presley died of a heart attack brought on by acute hepatitis. Elvis was asleep when the phone rang in the early hours of Thursday, 14 August. He knew what it was before he answered it. Vernon told him Gladys had died at 3.15am. In shock and disbelief Elvis rushed to the hospital. After Elvis entered his mother ward and the door closed, witnesses remember a piercing wild despair of wails from Elvis were heard as he wept and prayed long and loud over his mother’s lifeless body. 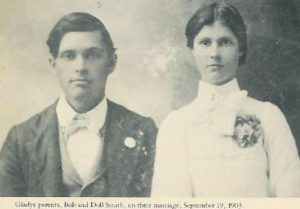 Gladys Love Smith parents Bob and Dolly Smith were Elvis’ grandparents on his mother’s side At the funeral Elvis flung himself at his mother in her coffin, hugging and kissing her, rocking her back and forth, weeping endearments and crying out to her in their own special language to come back to him. Many family members re-iterated that after his mother died Elvis changed completely. “He didn’t seem like Elvis ever again”. After the death of his mother, Elvis kept his father close to him. Vernon was with his son for the 2 years in Germany. 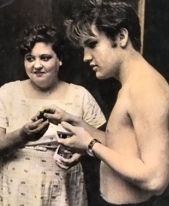 It was there he met the woman who become Elvis’ stepmother. When Vernon married divorcee, Dee Stanley in 1960, Elvis did not attend the wedding. However, Elvis invited his 3 step brothers (Dee’s sons by a previous marriage) Billy, David and Rick to live with him at Graceland. Throughout 70’s concert tour Vernon traveled everywhere with his son. As Elvis’ business manager, Vernon, with little schooling, had a difficult task organizing Elvis’ financial fortune. This was never more evident, upon Elvis’ death, when an over a million dollars was found in Elvis’ personal check book, half of which had to be paid in death taxes because Vernon knew little or nothing of tax exemptions.